When presented with the idea of making a three course meatless meal on Good Friday, I knew I was going to have to get creative in the kitchen and after doing a little research I came across this lovely little recipe online. I made a few of my own amendments to make it both lower in points and to make sure it was packed full of flavour and the result was incredible. The smell of the dish was to die for a my sister, who has always been dubious about trying salmon, absolutely loved it. The cous cous salad that accompanies it is a lovely and fresh option rather than rice or potatoes. In my OH’s opinion, the pomegranate seeks make the dish as they leave a lovely little fruity burst in your mouth. I got mine from Tesco but they are quite easy to get a hold of these days. You will find them in the aisle with the rest of the prepared fruit. This was the first time I’ve ever cooked with fresh fennel. Now I know some people don’t necessarily like the flavour of fennel seeds however rest assured, fresh fennel tastes nothing like it. Give it a try and you will be nicely surprised. If you really don’t fancy it (or can’t get a hold of it) just leave it out. I got mine from Tesco in a two pack and added the rest to my bolognaise the next day! Pre heat the oven to 180c and pop in a baking tray to warm up. Take a large frying pan, spray with 1kal and fry the onions, garlic, fennel and cumin seeds for around 10 minutes until soft. Add the zest of 1 lemon and leave the onion mixture to cool. In a small bowl, mix together the harissa and honey. Then take one half of the salmon, pop onto a large sheet of baking paper and cover with half of the harissa mixture. Top the salmon with the cooled onion mixture and then cover with the other salmon fillet. Cover the top of the second salmon fillet with the remaining harissa mixture. Take the warmed baking tray out of the oven and lift the baking paper and salmon onto it. Bake in the oven for around 30 minutes (or until cooked to your liking). 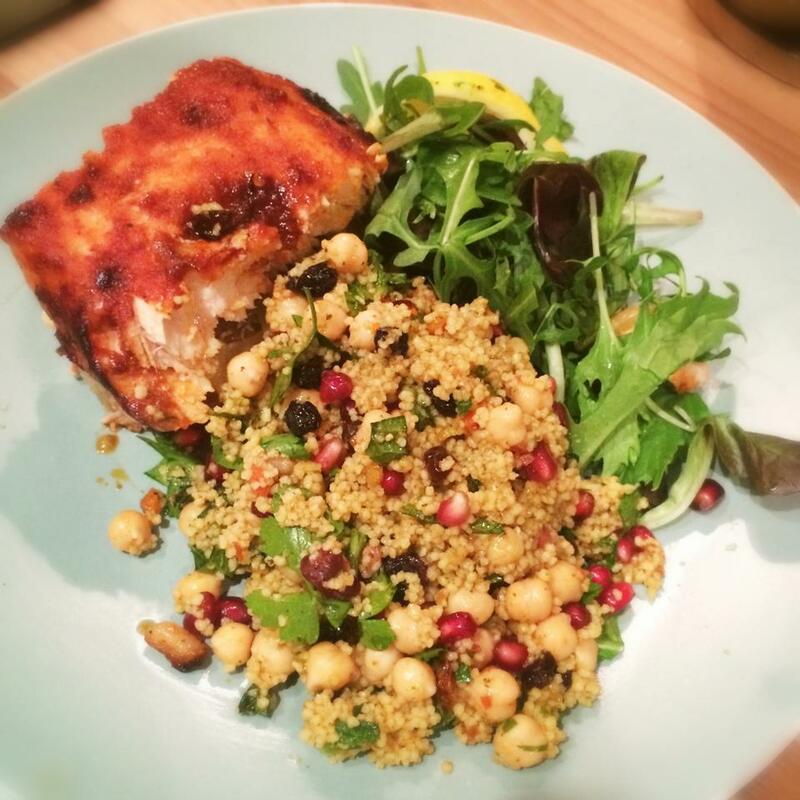 Whilst the salmon is cooking you can be getting on with making the cous cous salad. Crumble the stock cube into a large bowl and add the harissa, currents, cumin and cous cous. In another bowl pop the chickpeas and lemon juice and season. Pour 300ml of boiling water over the cous cous, stir and leave to soak for 5 minutes. Then add the lemon zest, parsley and mint to the chickepeas, stir and then add the whole lot to the cous cous. Finally add the pomegranate seeds to the cous cous and stir through. Finally swirl the harissa through the Greek yoghurt and top with a pinch of smoked paprika. You can either serve the salmon on top of the cous cous mixture, or like me, pop the cous cous on the side, salmon adjacent with a nice handful of green salad. Pop a dollop of the yoghurt on the side for a nice dipping sauce. Do you know how any smartpoints on the flex program? I presume slit less as salmon and chickpeas 0 SP!